Now that the weather is cooling down, zipper up your fleece and set out to explore the shopping, dining, entertainment and autumn festivals that abound in towns around Montgomery County. 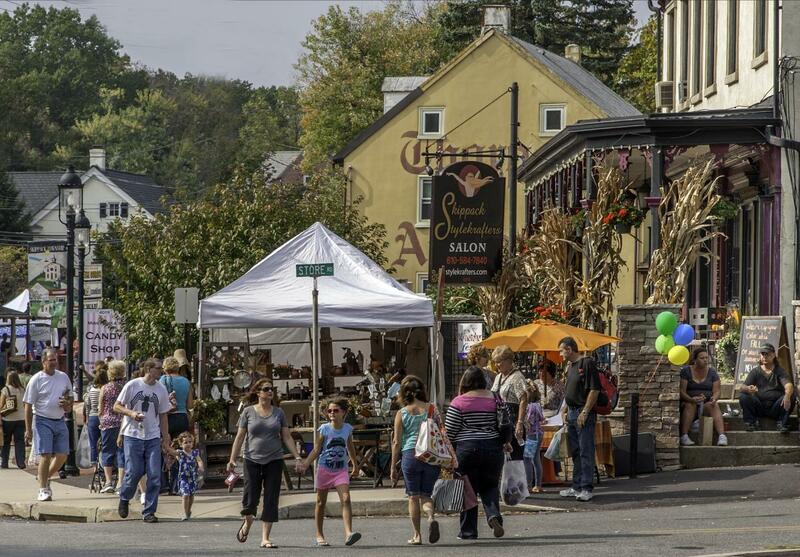 Taste of Autumn in Montco Part I takes you through the charming towns of Ambler, Jenkintown and Lansdale. Stroll quaint downtown Ambler where you can enjoy Saturday morning the final First Friday of the season Oct. 5 from 6 to 9 p.m. and the town’s Farmer’s Market at 9 a.m. Saturday, Oct. 6. Also upcoming Oct. 6 from 11 a.m. to 6 p.m. is Oktoberfest 2018 featuring a beer garden and over 90 vendors and 10 food trucks lining Butler Avenue and side streets. There also will be rides for kids and musical entertainment on two stages throughout the day. A cultural hub, Ambler offers a top-notch theatrical experience at the 130-seat, Barrymore Award-winning Act II Playhouse where you can take in concerts, plays, musicals and lectures. Or step beneath the grand Spanish-revival style Ambler Theater, opened by Warner Brothers in 1928, to enjoy contemporary and classic films. Visit The Stoogeum – the world’s only Three Stooges museum – open Thursdays from 10 a.m. to 3 p.m. Groups can visit by appointment on other weekdays. Over 100,000 artifacts dating from 1918 to present day are contained in this 10,000-square-foot space. It also is headquarters to the Three Stooges Fan Club which has 2,000 members worldwide. For dining, foodies flock to a plethora of restaurants including Dettera Restaurant & Wine Bar for progressive American fare and an array of wine choices; Gypsy Blu for inventive apps and entrees for lunch, brunch as well as happy hour specials; and The Lucky Well for some top Memphis-style BBQ, a whiskey bar and a live blues lounge. 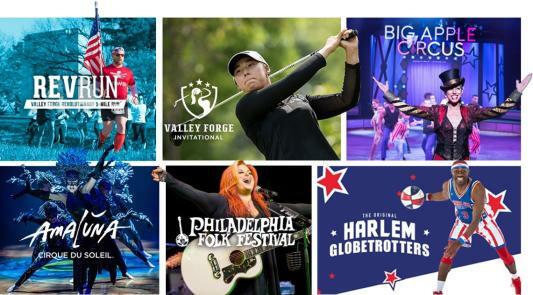 Visit https://www.valleyforge.org/crave/area-guides/ambler-restaurants/ for a full list of Ambler’s dining establishments. From Piazza on the Square for shopping to dining and a show at The Keswick Theatre, Jenkintown and neighboring Glenside and Abington offer plenty for visitors seeking a fall destination. Among the shopping option at Piazza on the Square are La Bella Donna for bridal fashions and Berta Sawyer for special occasion wear; Olive Lucy, for lovers of premium olive oils and balsamic vinegars; and thrift shops like Second Chances, that benefits the Women’s Center of Montgomery County. If you love The Goldbergs, check out The Goldbergs Tour of local spots dear to the heart of Jenkintown native Adam Goldberg, creator of the popular TV show. Take in a show at the circa-1928 Keswick Theatre – a grand venue that features top acts throughout the year. Upcoming attractions include the 40th anniversary tour of Kansas Oct. 5, Arlo Guthrie Oct. 7, Indigo Girls, Oct. 11 and 12, and The Music of Cream: 50th Anniversary Tour Oct. 18. For contemporary art exhibits and a sculpture garden renowned nationally, visit Abington Art Center on its historic 27-acre campus in Jenkintown. Ongoing exhibits through October include Carrie Biegler: Strength Source Project and Solo Series Fall 2018. 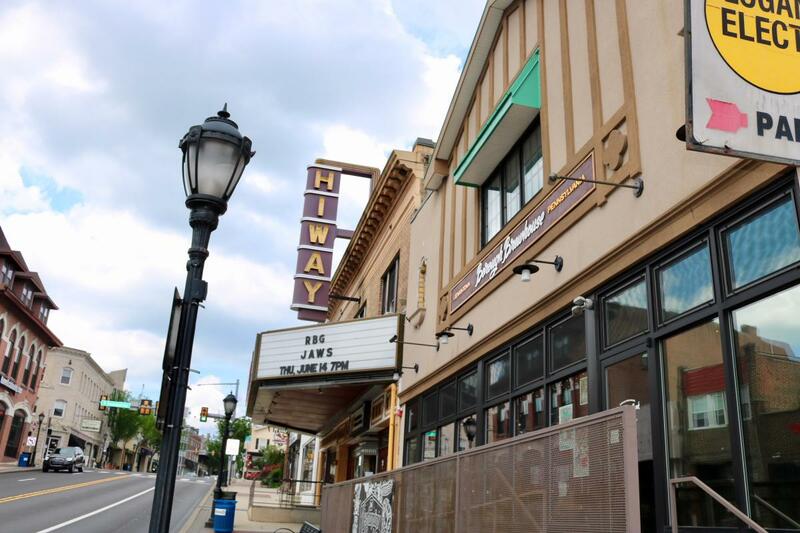 Enjoy classic films and new releases at The Hiway Theater in Jenkintown, a favorite of movie star Bradley Cooper who was raised in Jenkintown. Or, for fans of architect Frank Lloyd Wright, tour his unique Beth Shalom synagogue in nearby Elkins Park. Dedicated in 1959, Beth Shalom was the only synagogue Wright designed in his long career. It was listed as a National Historic Landmark in 2007. Whether you’re seeking a family outing or a night on the town, charming downtown Lansdale and its surrounding communities draws visitors with its range of offerings. On Saturday, Oct. 6 from 9:30 a.m. to 4 p.m., bring the family to the Apple Butter Frolic at the Mennonite Heritage Center. Enjoy delicious Pennsylvania German Food, everything apple including food tents and a pancake and apple sausage breakfast (7:30 to 10 a.m.), tractor and wagon rides and hearth cooking from the 18th century. Who doesn’t crave chocolate? There are few better places to surround yourself with this sweet delight than at Asher’s Chocolates in Souderton. In business for a century, Asher’s offers self-guided factory tours daily and a retail store to stock up on your favorites (dark chocolate-covered pretzels, anyone?). For a different “scentsual” experience, step into Scent and Sip where you can choose from over 100 fragrance oils to create soaps, candles, body lotions and more. Great for birthday parties, individuals, groups or girls’ night outs. Adults seeking craft brews, distilled spirits or wineries can have a field day (or weekend) in Lansdale by visiting Round Guys Brewing Company and Pub, Boardroom Spirits, Boyd’s Cardinal Hollow Winery and Stone and Key Cellars. After sampling brews, blends and wines, spend the night at the nearby Courtyard Philadelphia Lansdale. Restaurants run the gamut: There’s Umai for Japanese, El Tapatio for Mexican, The Oasis for Mediterranean dishes, Uncle Greg’s Smokin’ BBQ http://www.unclegregsbbq.com/ for, you guessed it. Café V-Dal offers unique Bulgarian crepes called “palatschinke.” Stove & Tap offers dozens of ales and lagers as well as comfort food.